If you're a business that receives a high volume of both cash and card (and maybe even cheque) payments throughout the day, you may find it hard to record all of these sales in Xero without a fair amount of effort. 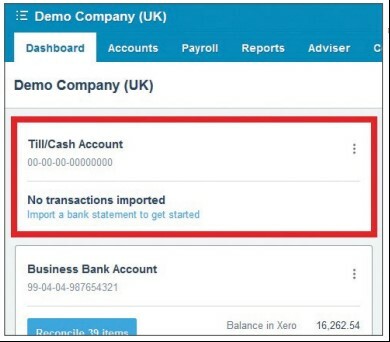 You could try and deal with these as and when the receipts appear on your bank reconciliation screen, but the cash sales will still need to be entered separately - which will result in more work (and possible errors/duplication). A useful trick' I've found over the years is to create a separate bank account on the dashboard specifically for the purpose of inputting all of your daily sales — regardless of how your customers have paid you. In this instance, I have called this new ‘bank' account the ‘Till/Cash Account' (fig. 1). your total sales for the day, which can be entered in Xero by either selecting Manage → Receive Money, or by importing as a .csv file. On your bank statement, you are likely to find regular amounts coming into your bank with a narrative along the lines of ‘AMEX’, ‘FDMS’, or something similar. These will relate to the card sales for a particular day, filtering through to your bank. Instead of using Xero’s ‘Create’ function on the bank reconciliation screen, all you need to do is use the ‘Transfer’ tab to move all of this income from the till account (where the income is currently sitting), to the bank account which you are reconciling (fig. 2). You would follow the same process for cash or cheques which are physically taken out of the till and taken to the bank as well. Each of these transfers from the till account to the current account will reduce your running till balance – leaving you with the physical cash sales which you have received and have not yet banked (bar any petty cash expenditure which you need to account for). Article published in XU Magazine.